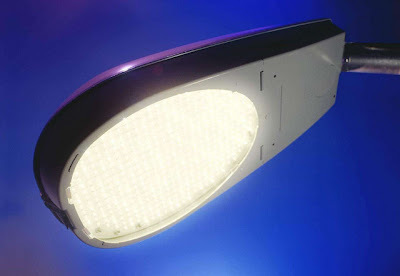 Ann Arbor is changing city street lights to power saving LEDs. They hope to save over $100k dollars a year in electricity costs. However, they also will be helping the citizens see the night sky, because LED fixtures are typically full cut-off type lights that direct the light to the ground instead of into the sky. LED lights are by design one-directional, as opposed to standard incandescent bulbs which radiate light in all directions. They are inherently more efficient because all the energy is used for it's intended purpose (to light a specific surface), and less energy is wasted on unintentional lighting of neighbor's windows or the night sky. ANN ARBOR, MI — The City of Ann Arbor, Michigan, the newest LED City™, expects to install more than 1,000 LED streetlights beginning next month. The City anticipates a 3.8-year payback on its initial investment. The LED lights typically burn five times longer than the bulbs they replace and require less than half the energy. 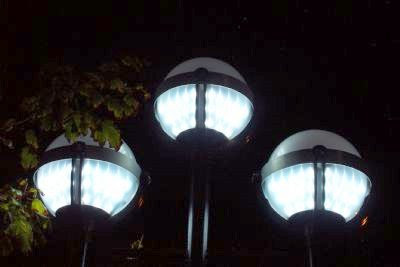 The LED streetlights currently installed in Ann Arbor are based on the New Westminster Series made by Lumec, Inc., which contain LED light engines from Relume Technologies, Inc. The light engines are based on the performance-leading Cree XLamp® LED. An older article here, describing the process Ann Arbor went through the past few years evaluating the lighting options. Here is an interview with the guy in charge of Ann Arbor's lights. Also a detailed description of the engineering issues. Cincinnati should do this. It would improve the quality of life, have long term costs savings, and it could help market Cincinnati as a green city. Everyone will be switching to these someday, why not be a leader? Previous post on stargazing in the city. It would be nice to replace the "War of the Worlds" floating eyeball lights. Be skeptical of any thing involving Ann Arbor. Be very, very, very skeptical. I know exaclty which lights you are talking about, with the extra tall poles and the balls on top. Must have been cutting edge in 1978.